When one installs SCOM R2 RC the Console is really different compared to the older versions. But these are just the looks. The real changes are to be found inside SCOM itself. Microsoft has delivered many guides in conjunction with SCOM R2 RC. Eventhough many of these guides contains placeholders, the information within these documents is certainly worthwhile to be read. To keep track of what guides to read and in what order, every guide contains a roadmap diagram. However it doesn't match completely with the guides contained within the file 'OpsMgr2007R2-RCDocs.zip'. Therefore I have made a small overview about what documents are to be found in the zip-file and what they are all about. A small note: the 'Migration Guide' depicted in the diagram has another name in the zip-file: 'Upgrade Guide'. These guides have self-explanatory names so they do not need further introduction. So what are the highlighted guides all about? The first guide 'OM2007_MP_OpsMgrR2.doc' writes about the SCOM MP for SCOM R2 RC itself. The second guide 'OM2007_ReportTrouble.docx' writes about how to solve problems one can encounter when installing/running the reportfunctionality of SCOM. The third guide 'OM2007_Usage.doc' is about how to use SCOM and is rather special. One could say on the first glance that it matches with the document 'Operations Guide' depicted in the roadmap diagram. But there are differences between both guides. The 'Operations Guide'- depicted in the roadmap diagram - follows the 'Deployment Guide' in order of usage and teaches a SCOM Admin what to do after a Management Group has been deployed. The guide 'OM2007_Usage.doc' provides information about how to use the SCOM Console to manage the monitored environment. This document contains examples about how to build different kinds of collection rules, how to create different kind of reports and so on, whereas the other guide doesn't go into that kind of detail. It is a very important file since it contains all the information about supported operating systems, hardware configurations, software requirements, installation combinations, and security configurations for SCOM 2007 R2 RC. Dell has released its new MP, to be downloaded here. As might be known the older version was buggy and very noisy: it could hose your SCOM-environment totally. Look here for that posting. PFE (Premier Field Engineer) Kevin Holman and I were in a race about whom would post first about it. He beat me to it. So I will not repeat his posting but link to it since his posting is - as usually - a good one. His posting can be found here. My comments on the MP: not many major changes and the MP needs a lot of work in order to make it far less noisy. Personally I still think this MP has the potential to hose the SCOM environment. So do not run it without any modifications. Another piece of advise: run the 'installer' DellBMCLogSetup.exe on the Management Servers so the folder 'c:\DellReports' will be created containing the executable 'DellBMCLog.exe'. Last night: Microsoft has released SCOM R2 Release Candidate on Microsoft Connect. Found here. Strangest thing was that other views they had also created could be deleted without any problem. So I had to dive deeper and to find the difference between the views which could be deleted and the ones which couldn’t. First thing I noticed that the problematic views weren’t displayed in the correct order. Normally the available views in the monitoring pane are being displayed in alphabetical order, but these views seemed to appear in random order. The SCOM Administrators didn’t have any clue. But when I told them that it seemed like these problematic views did have another name than being showed in the Console they told me these views did have other names when they were created. Soon enough it appeared that all the Views which couldn’t be deleted did have other names when they were created. When I asked them how they had changed the name of the view they told me by selecting it, hitting <F2> and then changing it. So there was the cause. And the remedy was simple. So there is the reason these changed Views cannot be deleted: the Default MP still has the old name and when one wants to delete it, it’s changed name cannot be found in the Default MP. Hence the errormessage. Eventhough the original name is still to be found in the Default MP, the new name has an entry as well. So now when one wants to delete this view, it won’t be any problem what so ever. 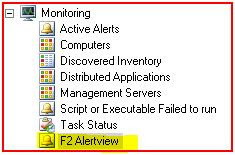 This best practice is not only to be used for Views in SCOM but for all objects. Whenever a name needs to be changed, do not use the F2 option, but lookup its properties and change it from there. Beware! When editing the registry one can cause damage which cannot be undone. So be carefull when performing the procedure mentioned in this blogposting. Always make an export of the registrykeys before deleting ANYTHING from the registry. Ok, having said that, there is a nice trick to get the SCOM Console running faster. At a customerssite I bumped into a situation where the SCOM operators complained about the performance of the SCOM Console. And they were right. It was very slugish. So I checked the RMS and the related SQL server. These servers were performing just fine. No glitch what so ever. They were dimensioned properly (enough cpu, RAM and fast disks) and when running perfmon on those servers, all was well. So the cause of the slugish SCOM Consoles wasn't to be found there. Then I turned my attention to the systems of the SCOM Operators. First I found that they were running the SCOM Consoles with the /ClearCache command. They started with SCOM when it came RTM and with RTM it was advised to use that switch. But when they upgraded to SP1, they were still using this switch. But it is Best Practice only to use this switch when there are problems with the SCOM Console. Under any other circumstances this switch is not to be used. So I deleted this switch. The performance of the SCOM Console did improve but not enough. Then I asked them for how long they were using the SCOM Console from their systems. As it turned out, from the moment they started to use SCOM which is more than a year now. All this time they had only upgraded the SCOM Console to SP1 but never ever changed anything about it. Besides the well known cache file when one starts the SCOM Console, another 'kind of cache' is created as well. In the registry of the current user, the navigation history within the SCOM Console is being added. And on the systems of these SCOM operators this regkey had grown hugely. So when I deleted this key and started the SCOM Console, it was very snappy. No more sluggish SCOM Console but one which worked really fast. Of course you can perform this 'trick' as well. But remember this regkey has a function so only do this when you are experiencing the same issues and are sure that the RMS and the SQL servers are performing well and not the cause of a sluggish SCOM Console. First close the console and than remove this regkey: HKEY_CURRENT_USER\Software\Microsoft\Microsoft Operations Manager\3.0\Console. 27-08-2009 Update: When sealing a DA other issues come into play. As a result not all objects are displayed in the Diagram View of that DA. Check here for a workaround. 13-03-2009 Update: Microsoft has released a QFE which addresses this problem. It is KB958490 to be found here. However be VERY VERY careful deploying this hotfix. See Marius Sutara's blogposting about it. Look here. When one creates a Distributed Application based on the blank (advanced) template there is a significant change the DA ends up in an unmonitored state. When one looks at the diagramview of this particular DA it will show most of the child nodes without the green checkmark. But when such a child node is clicked further open, the components of this child node do show the green checkmark. So these components are being monitored but somehow this status doesn't roll up to the child node and the top level node. And presto! Already during Maintenance Mode things started to change. Green checkmarks were appearing! 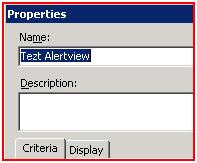 The child node - first without the green checkmark - turned up in a monitored state and not only that, the top level node showed up in a monitored state as well. And even better, it stayed that way after the set time for Maintenance Mode was passed. So with putting these child nodes into Maintenance Mode it looks like the DA is becoming aware of what components it is made off and starts working as it should. I have repeated these Maintenance Mode steps for each child node being in an unmonitored state, and here this trick worked just as fine. Since I can not imagine being the only one experiencing this problem I have posted it on my blog. 08-05-2009 Update: Check this posting about a possible solution. There is a possibility that the DNS MP itself is OK but that there are problems with the way DNS is defined in WMI. Issues with the DNS MP ? Despite of the two earlier postings about the Alert 'Script or executable failed to run', I keep bumping into this issue at many customer sites. It has everything to do with the most recent version of the DNS MP (version 6.0.6480.0). There are two discoveryscripts for DNS (DNS2003Discovery.vbs & DNS2003ComponentDiscovery.vbs) which keep on failing. Strangest thing is, the servers on which they fail, scripts from other MPs (AD, DHCP, Server OS, GPO and so on) are running smoothly. So I tend to think there is still some work to be done on the DNS MP. Until now I haven't been able to find much information about it on the internet. So I am interested what kind of experiences others are having with this DNS MP. Hope to hear from you. There aren't many books around about SCOM 2007. For getting 'the job done' in order to pass the exam (70-400) the Sybex book 'Mastering System Center Operations Manager 2007 ' is a good read. However, when I finished this book it left me with many unanswered questions. How happy I was when a colleague of mine showed me the book 'System Center Operations Manager 2007 Unleashed'. This book contains many many examples out of daily practice and describes SCOM in every detail. This book has become my personal 'SCOM bible'. It is like 'All You Ever Wanted To Know About SCOM But Were Afraid To Ask'. Even the lesser known features of SCOM like ROM (Remote Operations Manager) are described. So when I read this blogposting about a supplement to this book - all about SCOM R2 - it really made me happy. Can't wait to read it. For all SCOM administrators/users/supporters out there all I can say: this book is a must have. In conjunction with some very good blogs these are the BEST SCOM resources to be found. Whenever you have a good source as well, share it with the community. Send me the link and I will update this posting with it.